Here's a quick rundown for any readers who are in the dark on this latest Robert Rodriguez effort. 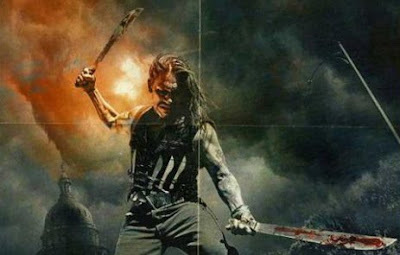 "Machete" started off as a faux trailer that played in between Planet Terror and Death Proof the double feature film by Robert Rodriguez and Quentin Tarantino titled Grindhouse. The trailer was a huge hit and quickly word spread that a feature length film would follow. Originally word was that the film would be direct-to-dvd, but after some legendary castings, the film is headed for a theatrical release this Labor Day, September 3rd. Being Cinco de Mayo and being good friends with Harry Knowles over at AICN, RR decided to give his fans a little treat and also a bit of a political message. The brand new "Machete" trailer is being labeled as the "Illegal" trailer because it calls out the situation going on currently in Arizona (Sorry this forum is for Entertainment and I'm not going to get the politics of it all, head over to CNN for that).